"Z" is for Zig-Zagging through time and for creating the ever impressive Ziggy. Z is for Zorro, because Sam looked like Zorro at the start of the episode "Private Dancer". I agree. Shall I start from A again? A - is for artist, Sam is a good singer and dancer, he also plays guitar. B-- is for Boy genius, for going to college so young and knowing how to do calculus before 5. C - is for "college", specifically MIT where he whipped through a 4 year program in 2 years! D - is for "dairy farm," where Sam grew up. 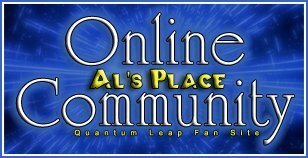 E-- is for the experimental project Quantum Leap, that Sam tried before it was really ready. F is for friends. Sam couldn't do what he does with out his good friend Al. GFTW... who is controlling the leaps? H - is for "high heels," which Sam "hates." I - is for intelligence and initiative, which Sam has a lot of and puts into good use. J-- is for joking, jabs, and jests, the three things that Al loves to do to Sam when it comes to the topic of girls or popular meida. K - is for "Katie," Sam's sister. N is for Nicole, Sam's old piano teacher. O is for "Oh boy!" Q - Quark. As in, "What the hell is a quark?!" R- is for "really sharp dresser" which is what I am! lol! S - is for "Swiss cheese," which is what poor Sam's brain emulates.